The ideal all-round paddleboard for the heavier paddler. The latest addition to the Red Air range stands out as the only quality all-round inflatable paddleboard at 32″ wide, and is ideal for the heavier rider, or simply anybody wanting just that little bit more stability in their ride. Better still, it has the progressive rocker line of the Red 10′, which basically means it has a lot of curve preshaped in to it, making it very very nice indeed for surfing. It will catch even the smallest waves with ease, yet it has enough curve in both its rocker and its plan shape to be really quite comfortable in medium sized surf too. Super stable, really easy to use, and with glide of the kind you only get from inflatable boards. Remember the first time you used a mountain bike with shock absorbers? That smoooooth feeling? That’s what we’re talking about here. 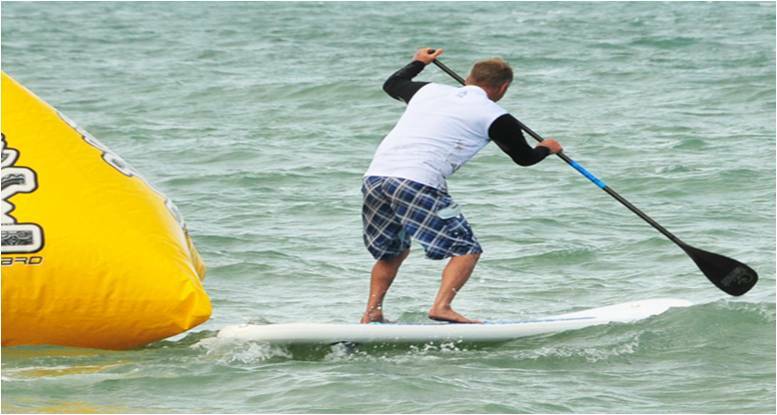 This is a great all-round SUP for learning, cruising, surfing, exploring, and general family fun. You can pretty much do anything on it! Full EVA deck for under foot comfort and three moulded fins finish off this fantastic family cruiser, that’s super durable and still small enough to be packed away in a small bag at the end of the session. All Red Air boards come with a carrying bag (with rucksack straps), a repair kit (not that you’ll need it but better safe than sorry), and a powerful h-tech pump fitted with a pressure gauge so you know when you’ve got enough air inside. Direct from the http://www.thepaddlecompany.co.nz website. SUP that Inflates in under 5 minutes!! A Red Air is the most practical and portable type of Stand Up Paddle Board. It packs into a holdall and inflates in under 5 minutes. Its hi-tech design makes for a stable and solid board. The flat water glide of even the smallest Red Air is exceptional and comparable to larger hard boards. When you buy a Red Air board you are provided with an inflation guide. In case you have lost your guide you can download a copy below.